Pauridia is a genus in the Hypoxidaceae family. 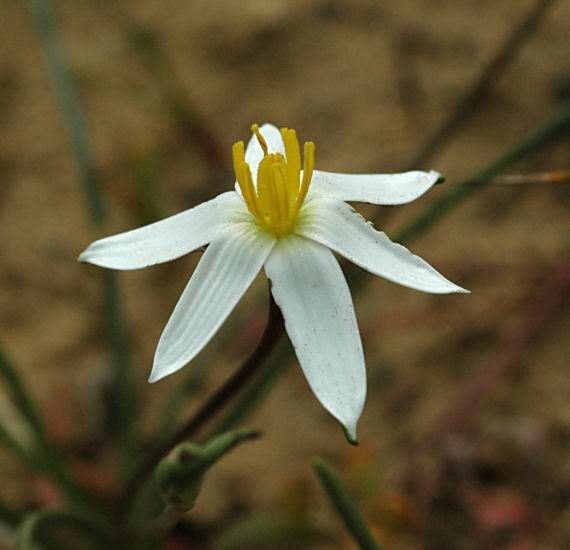 Previously it included only two species found in the southwestern Cape, South Africa, Pauridia longituba and Pauridia minuta. 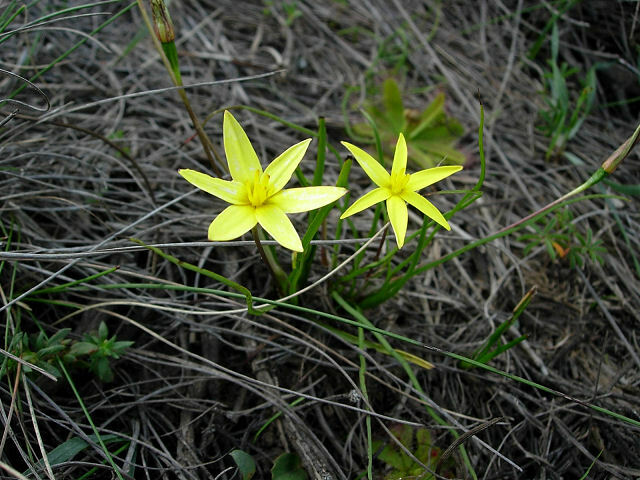 In 2013 in an article entitled The genus Pauridia (Hypoxidaceae) amplified to include Hypoxis sect. Ianthe, Saniella and Spiloxene, with revised nomenclature and typification written by Deirdre A. Snijman and Alexander Kocyan this genus was expanded to include 35 taxa. 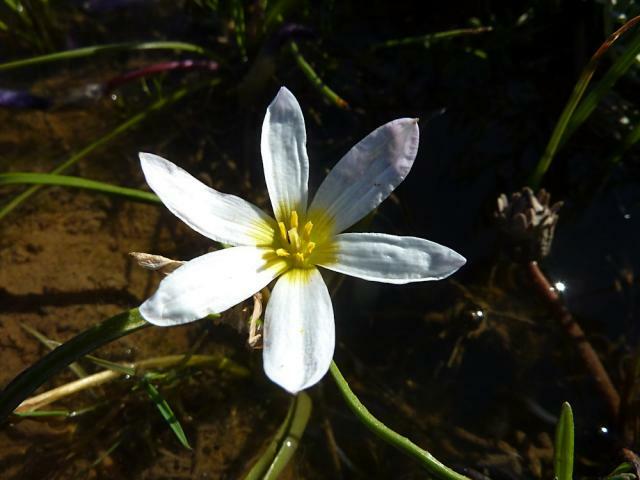 It now includes genera Saniella and Spiloxene found mostly in seasonally damp sites within the winter rainfall and all-year-round rainfall regions of Namibia and South Africa and the Australian, Tasmanian and New Zealand Hypoxis sect. Ianthe. 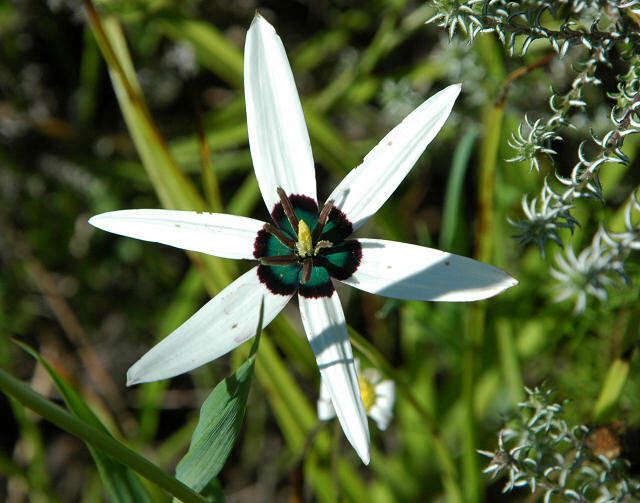 The majority of the species (86%) are endemic to southern Africa with the highest concentration in the Western Cape. 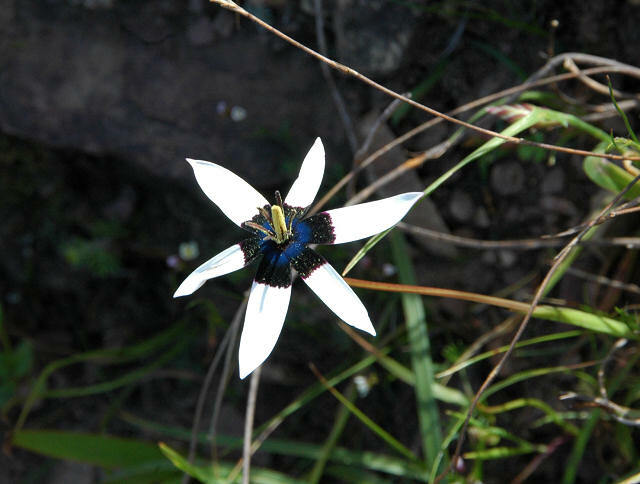 In 2014 Deirdre A. Snijman published A taxonomic revision of the genus Pauridia (Hypoxidaceae) in southern Africa including distribution maps, illustrations, morphology, new taxa, systematics. She concludes: "The northwestern and southwestern Cape has the highest concentration of species and according to IUCN criteria is home to three Endangered species (P. canaliculata, P. maximiliani, P. pygmaea) and two Vulnerable species (P. alba, P. linearis), found mainly in the lowland areas where natural habitats have been extensively fragmented." 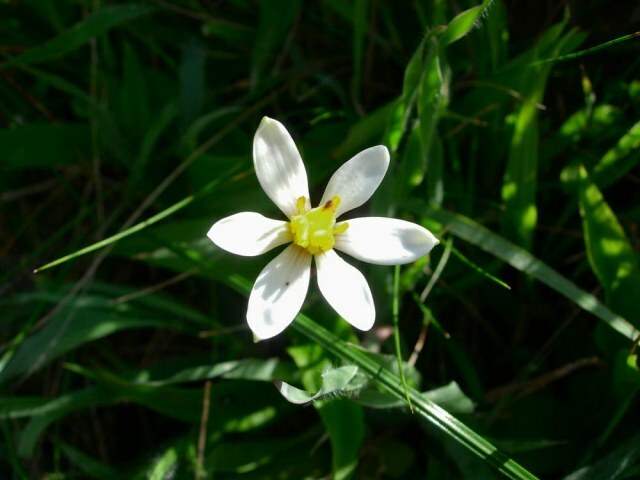 Pauridia alba (Thunb.) Snijman & Kocyan, syn. 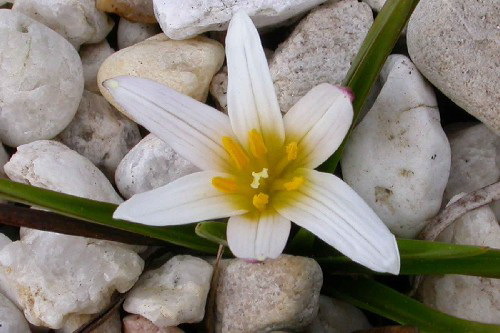 Spiloxene alba (Thunb.) Fourc., is considered to be vulnerable. 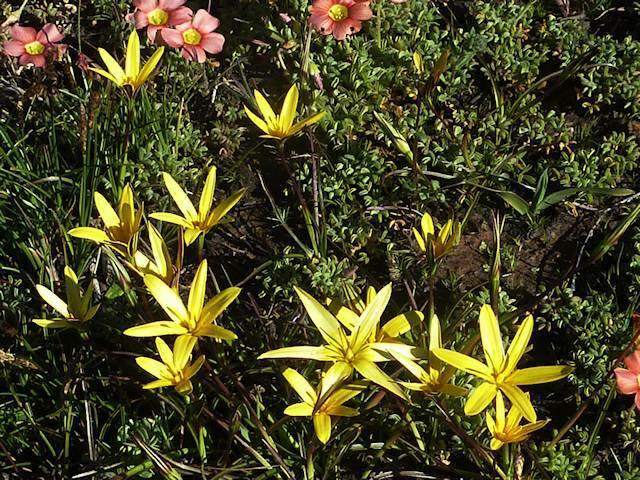 It is found in marshes and damp flats in the western Cape in heavy, clay soils within remnant patches of renosterveld and in sandy loam-rich soils amongst alluvium fynbos in the lowland areas where natural habitats have been extensively fragmented. 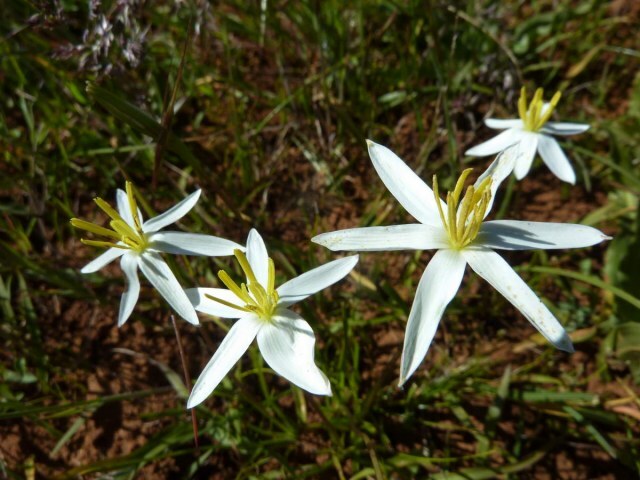 Plants grow 3 to 19 cm tall with 2 to 5 erect, succulent, linear leaves. There are 1 to 2 white, rarely cream with a yellow center or yellow flowers with a pink reverse per scape. 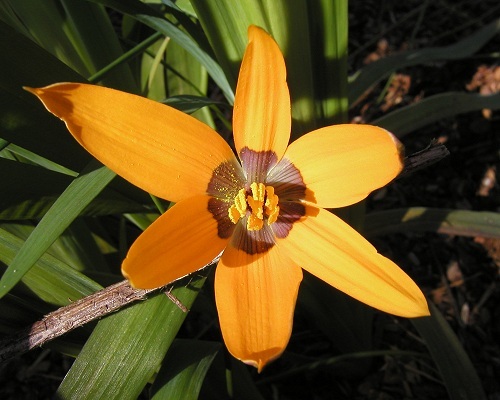 The flowers are often faintly sweet scented. Although similar to Pauridia aquatica, this species has a prominent ovary beak. 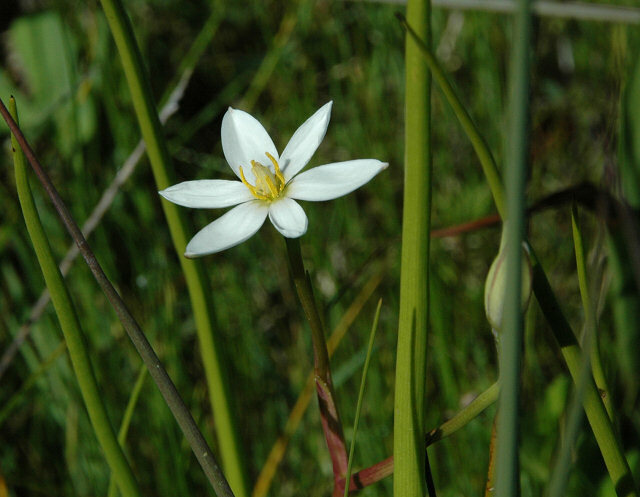 This species flowers April to June, much earlier than a lot of the other species, with the inflorescence appearing before the leaves but with the emergence of several prominent, sheathing cataphylls. 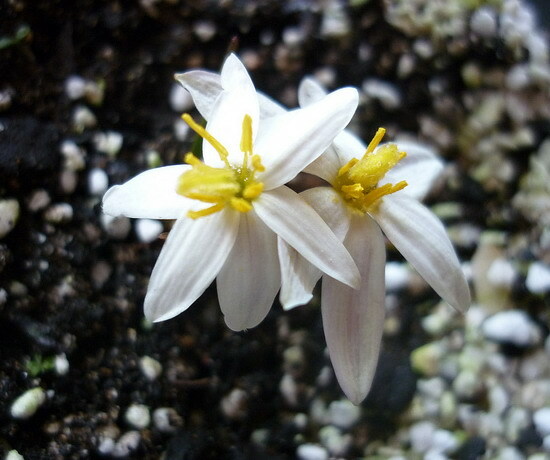 Photos from Terry Frewin show the flowers and the distinctive corm. Pauridia alticola Snijman & Kocyan, syn. Saniella occidentalis]] (Nel) B.L.Burtt, syn. 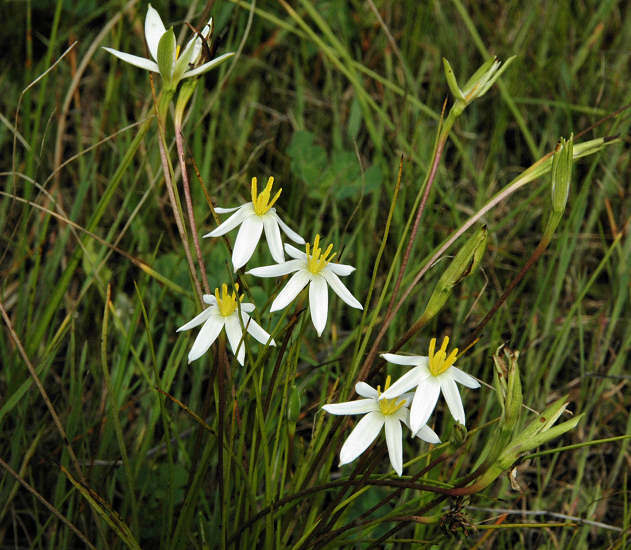 Empodium occidentale (Nel) B.L.Burtt., is found in damp depressions in heavy soils at high altitudes in the mountains near Calvinia, Sutherland, and Ceres, South Africa. The photos below were taken by Cameron McMaster near Middelpos in the Roggeveld. 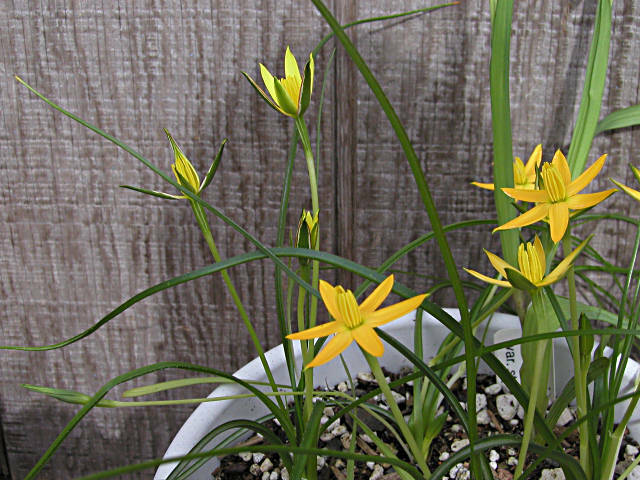 Pauridia aquatica (L.f.) Snijman & Kocyan, syn. 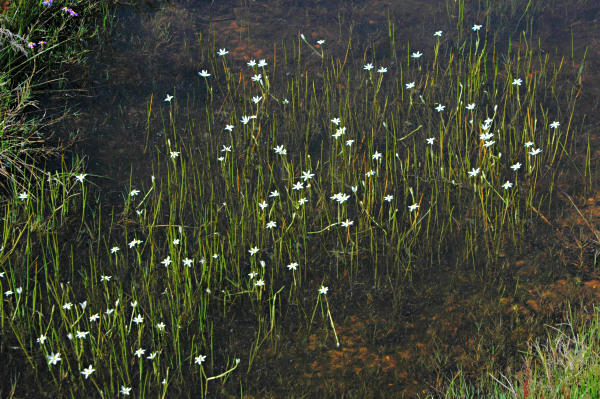 Spiloxene aquatica (L.f.) Fourc., is found in seasonal pools and streams. 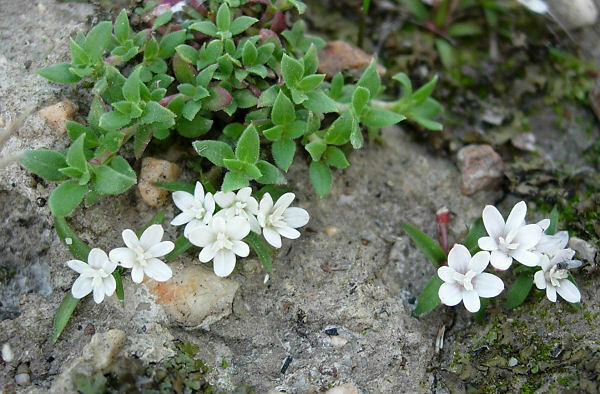 It has small white flowers and cylindrical leaves and flowers June to November. It ranges from Namaqualand to the Cape peninsula and the Southern Cape. Photos 1-3 taken near Tulbagh August 2006. Photo 4 was taken near Nieuwoudtville September 2006. Photos from Mary Sue Ittner and Bob Rutemoeller. Photo 5 was taken in the Overberg and photo 6 was taken near Nieuwoudtville by Cameron McMaster. Pauridia canaliculata (Garside) Snijman & Kocyan, syn. 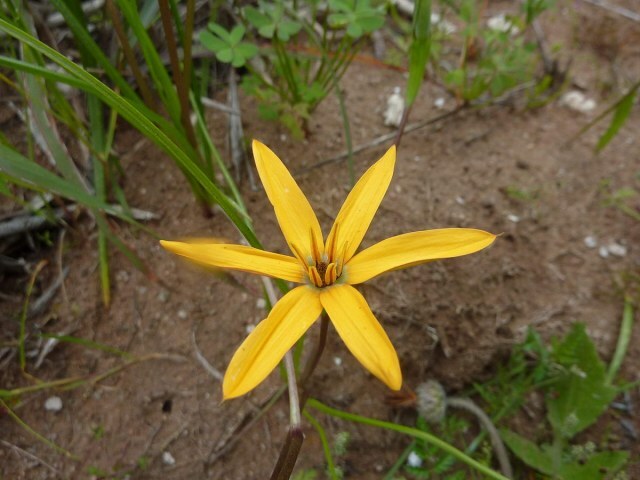 Spiloxene canaliculata Garside, is found in seasonally wet flats in heavy soils in the Southwest Cape. It is considered endangered. 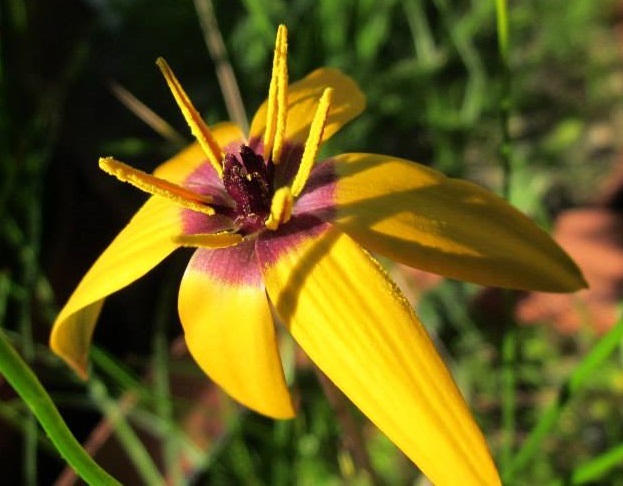 Flowers are orange to yellow with a dark purple non-iridescent center and when closed you can see the reddish stripes on the back. Leaves are u-shaped without a midrib. 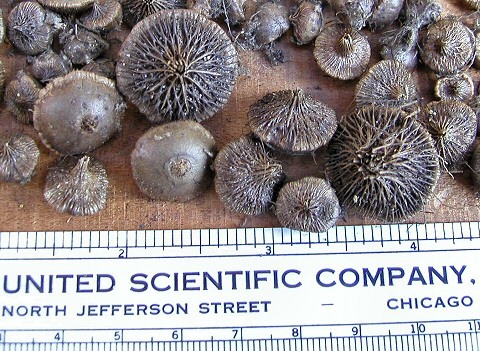 Seeds are J-shaped. It flowers July to November. The first two photos taken near Darling are from Cameron McMaster. 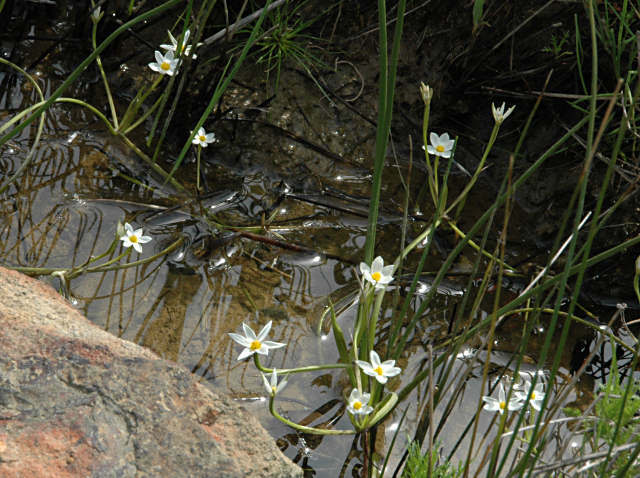 The third photo was taken by Mary Sue Ittner near Darling shown with Drosera cistiflora. The fourth and fifth photos were taken by Bob Rutemoeller and Mary Sue Ittner showing the front and back of flowers. The last photo taken by Mary Sue Ittner shows the corms with their cap of short hard bristles. 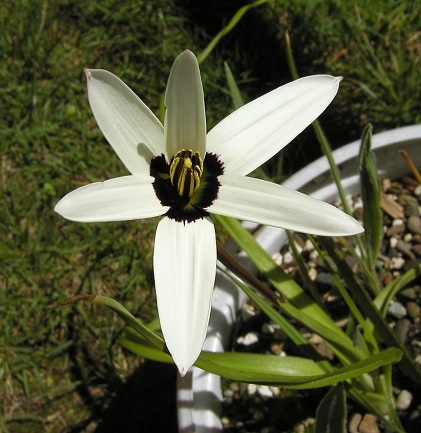 The photo below from Mary Sue Ittner may be a hybrid between this species and Pauridia capensis. 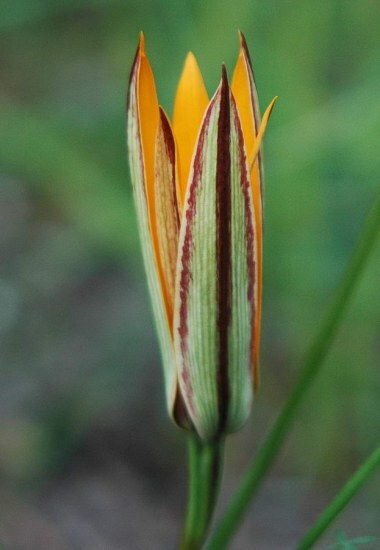 Pauridia capensis (L.) Snijman & Kocyan, syn. 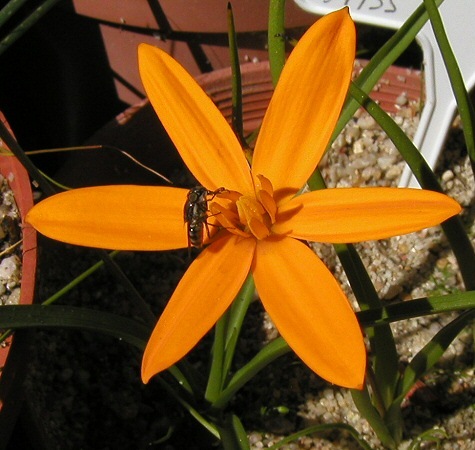 Spiloxene capensis (L.) Garside, is one of the more attractive species with white, cream, yellow, or pink flowers that are unspotted or have an iridescent or non-iridescent dark center. Leaves are linear, v-shaped in cross section, distinctly keeled with often thickened margins, usually with minute recurved teeth. Seeds are ovoid. 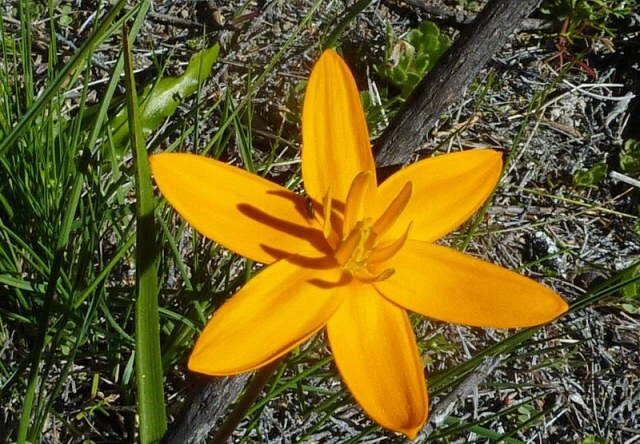 It flowers winter into spring and is found in seasonally wet flats in the Cape region. The first two photos were taken by Bob Rutemoeller. The third photo was taken by Alan Horstmann. The fourth photo is from Gordon Summerfield. Corms are very unusual with a cap of short fine bristles. The last photo by Mary Sue Ittner shows the corms with a top and bottom with a ruler for size. Habitat picture show many of the different color variations you might discover in the center. The first two were taken September 2003 by Bob Rutemoeller. The first was taken at Drayton and the second at Boskloof. The next three were taken by Cameron McMaster at Drayton and Napier and Darling. Photographs below were taken late August and September 2006 by Mary Sue Ittner. The first shows a mass blooming near Brackenfell where there had been a fire the summer before. The second was taken near Tulbagh of a form with a turquoise center and the third on the path around Lion's Head where a form with a blue center was observed. Photos below of yellow flowered forms. 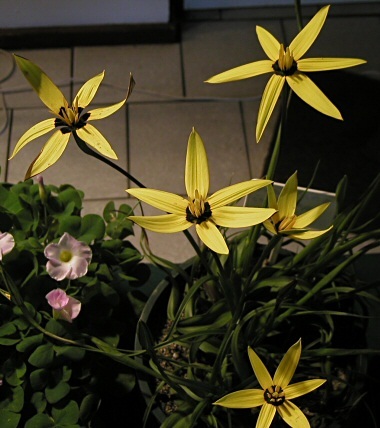 The first two photographed by Bob Rutemoeller of one exhibited at the IBSA Symposium August 2003 and the second grown by Alan Horstmann. The third and fourth were photographed by Alan. The fifth photo was taken by Gordon Summerfield. The last photo was taken by Cameron McMaster near Middelpos in the Roggeveld September 2011. 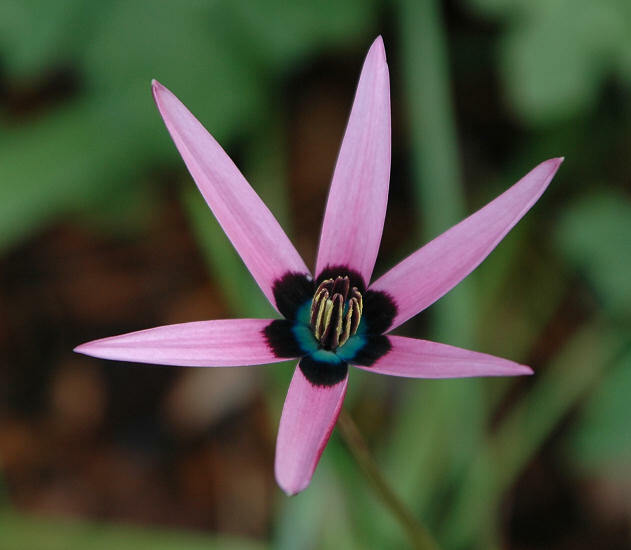 Photos taken below of a pink flowered form by Mary Sue Ittner. Pauridia curculigoides (Bolus) Snijman & Kocyan, syn. Spiloxene curculigoides (Bolus) Garside, is found in the Western Cape from the mountains near Tulbagh to the Hottentots Holland Mountains, the Cape Peninsula, and eastwards to the Agulhas Plain where it is found in fynbos, often on south facing slopes in deep sand or gravel and on shale bands, usually in seasonally moist habitats. 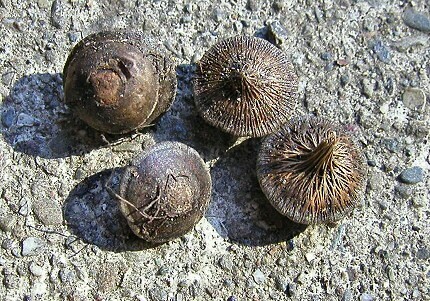 Plants are 4 to 18 cm with an almost conical corm, covering old flat-based corm discs with tunics that are frequently protracted into a neck of thick, rigid, blunt, brown fibres that partially cover the two cataphylls present in the early stages of flowering. 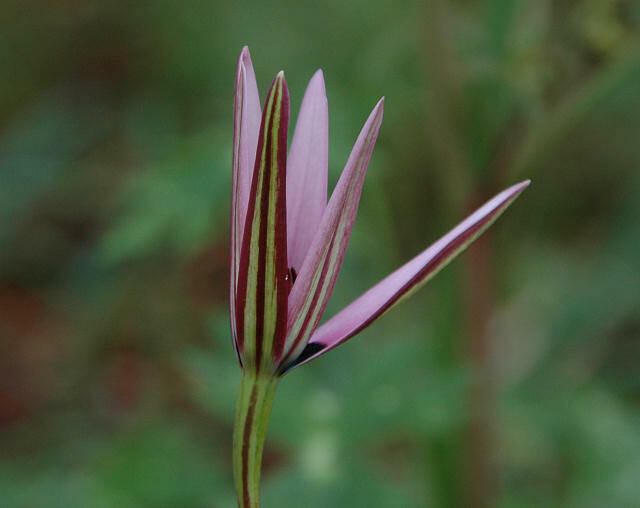 It has a one-flowered inflorescence with the pedicel incompletely sheathed by a conspicuous, long, leathery bract. 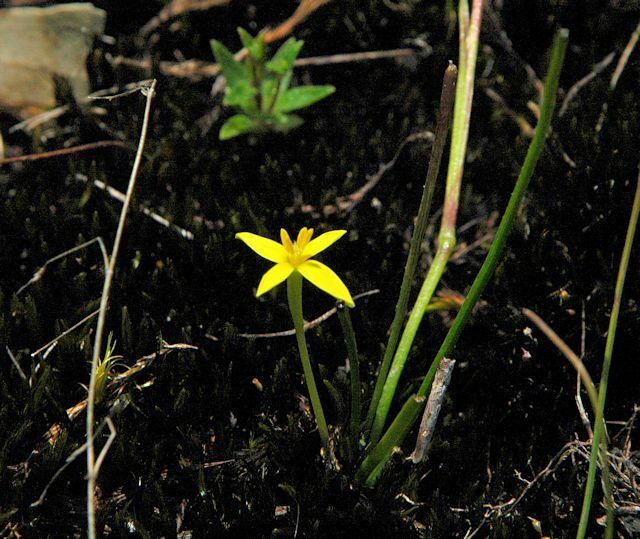 Narrow tepals are plain yellow with pale green backs on the outer tepals and reminiscent of those in Empodium plicatum. 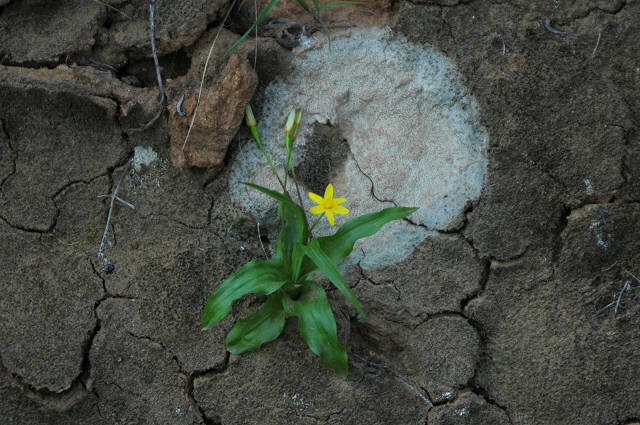 It usually flowers April to June, sometimes later, especially after fire. Photo taken near Napier in the Overberg by Cameron McMaster. Pauridia flaccida (Nel) Snijman & Kocyan, syn. 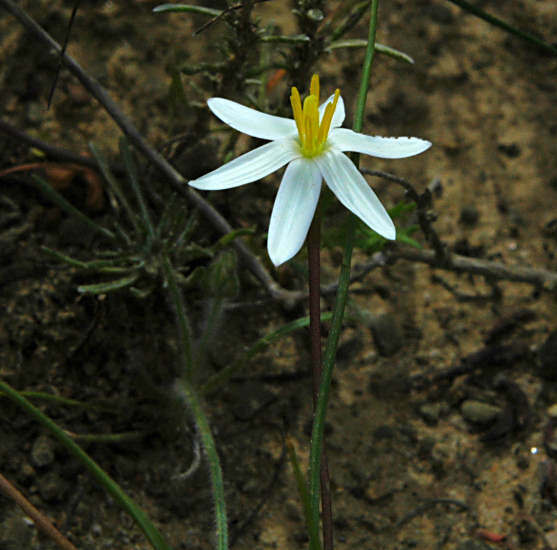 Spiloxene flaccida (Nel) Garside, is found on damp flats and slopes often in moist, rocky crevices from the Cape Peninsula to the southeastern Cape. 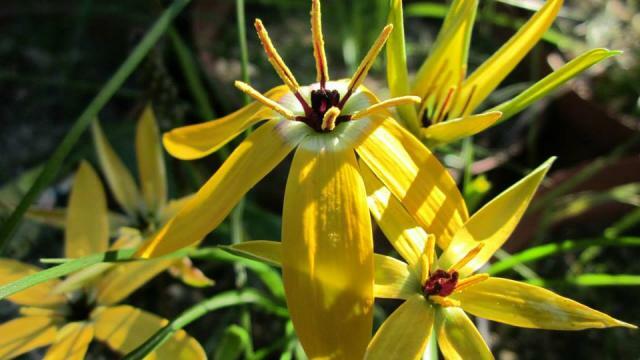 Growing to 25 cm high, it flowers July through September. 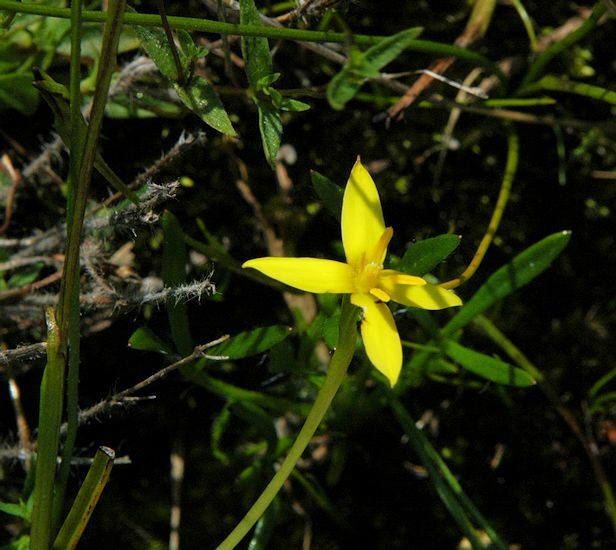 This species usually has two yellow flowers with green backs borne on thin flaccid stems and grass-like soft recurved leaves that are v shaped in cross section. The first two photos were taken by Mary Sue Ittner and Bob Rutemoeller near Brackenfell. The last two photos by Cameron McMaster taken in the Overberg. Pauridia gracilipes (Schltr.) 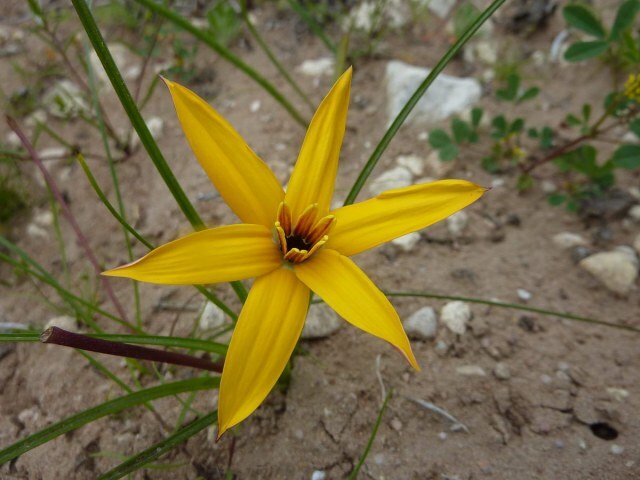 Snijman & Kocyan was previously included in Spiloxene ovata but in the paper cited above, the yellow flowered plants which are widespread in the western part of the Greater Cape Floristic Region are now considered to be this species. Plants of Pauridia gracilipes vary considerably in size, from 2.5 to 23 cm tall. 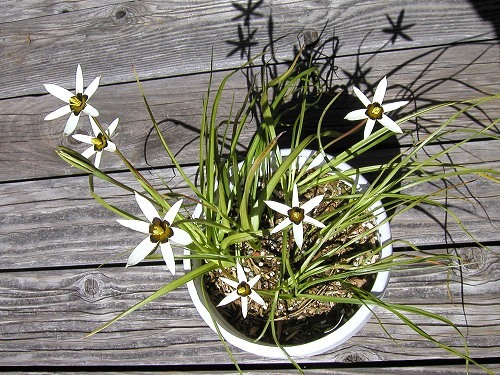 The ovoid to globose corm is covered with hard to twisted roots, the 2 to 10 leaves are dark to pale green, linear to lanceolate, and flowers are one per pale green, pale pink or pale reddish brown scape, yellow, or rarely orange backed with pale green or reddish brown in outer whorl. 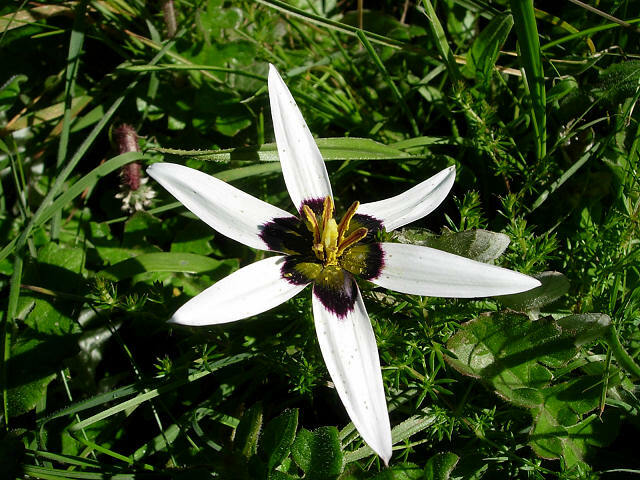 It flowers June to November, later at high altitudes. Pauridia gracilipes ssp. 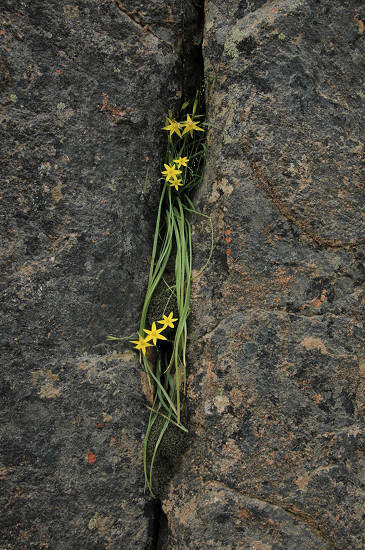 gracilipes is found in the Northern Cape and Western Cape Provinces where it grows in soils derived from decomposed granite and sandstone, usually along the edges of seasonal streams and seepage areas, and often partially shaded by rocks. 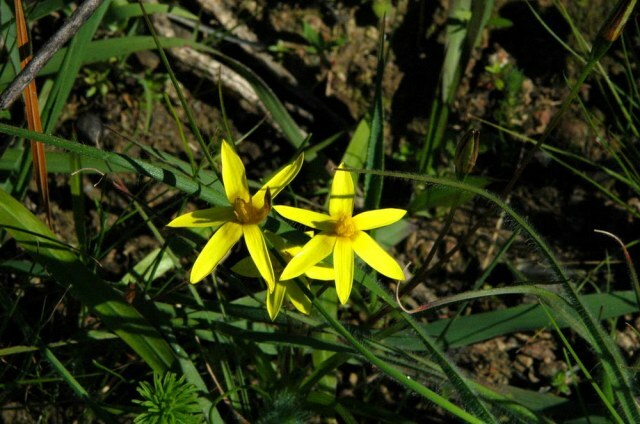 It is distinguished from the other subspecies by having smaller yellow flowers. 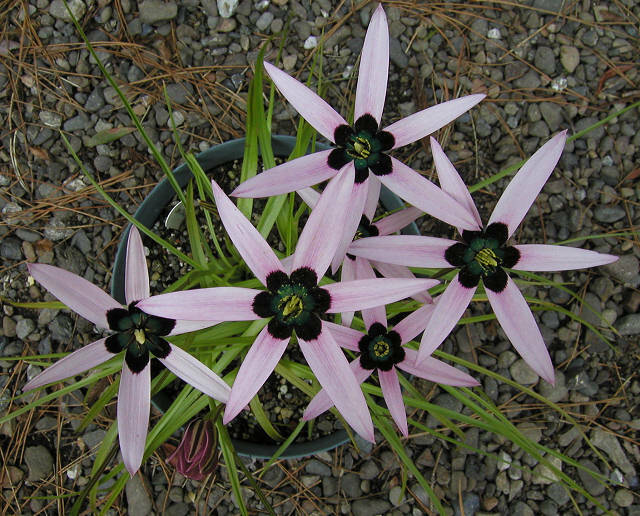 The first photo was taken by Bob Rutemoeller at Telos Rare Bulbs. 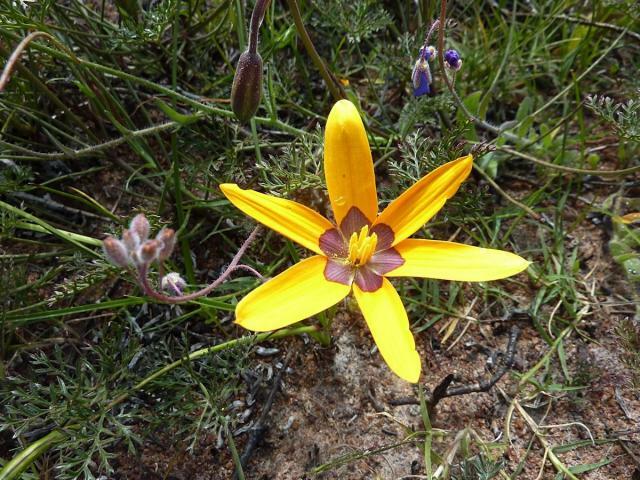 The second picture was taken by Mary Sue Ittner in Namaqualand. The third photo was taken by Bob Rutemoeller September 2006 near Nieuwoudtville. Pauridia gracilipes ssp. 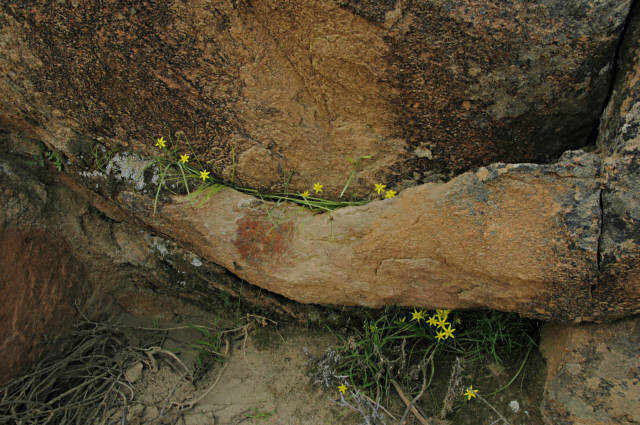 speciosa Snijman is endemic to the Kamiesberg, Namaqualand where it is found at elevations of 1100 to 1300 m in shallow loamy soil in seepage areas near the base of granite domes and along the banks of seasonal streams. It differs from ssp. gracilipes by haing somewhat stiff leaves and deep to pale orange flowers distinguished by having tepals, stamens and style all the same color. The outer tepals are also usually flushed dorsally with reddish brown. 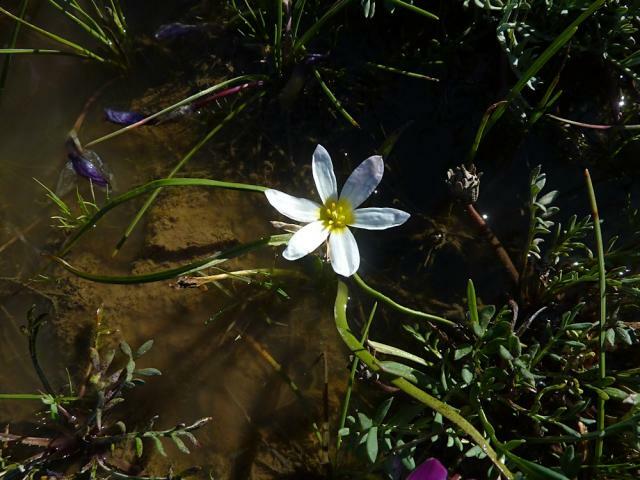 The first two photos taken by Cameron McMaster in Namaqualand. 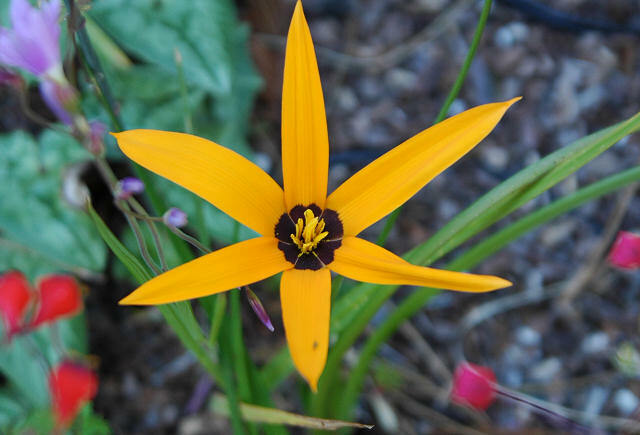 The last photo from Gordon Summerfield of a plant in cultivation. Pauridia linearis (Andrews) Snijman & Kocyan, syn. 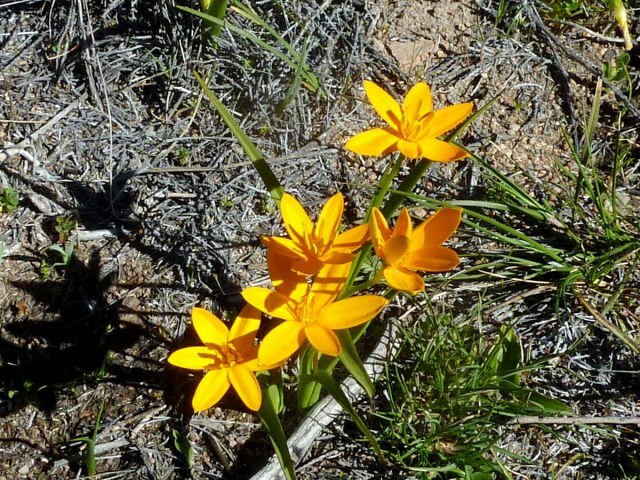 Spiloxene linearis (Andrews) Garside, was considered to be part of the Spiloxene serrata complex in Goldblatt & Manning 2000, but is now considered to be a highly localized vulnerable species found in the coastal southwestern Cape from Jacobsbaai to Mamre where it grows in limestone and granite soils in full sun. 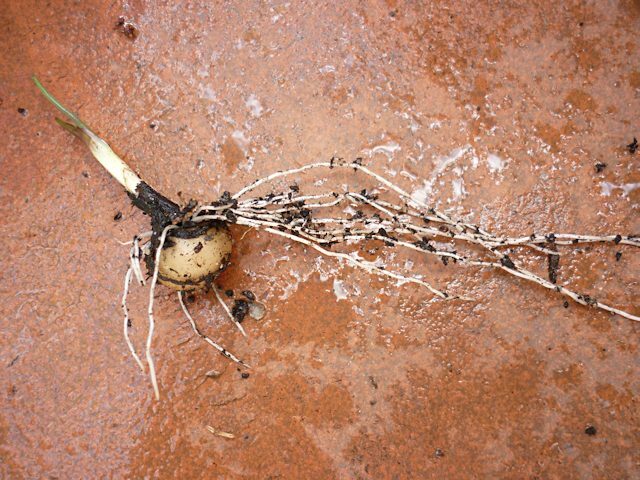 Plants grow from 10–40 cm tall with a somewhat globose corm that is encircled by roots. Flowers are cadmium orange or yellow usually with a small reddish brown eye and are backed with a broad median green stripe. 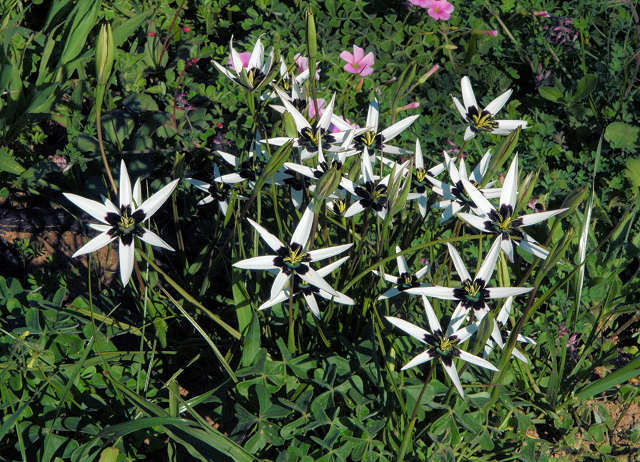 The flowers have dark stubby stigmas. The first two photos from Gordon Summerfield. The next two photos from Cameron McMaster were taken at Jacobsbaii. The last picture was taken near Darling (coastal western Cape) September 2006 by Bob Rutemoeller. Pauridia longituba M.F.Thomps. 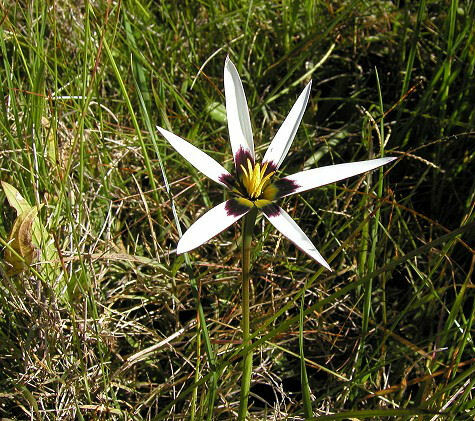 is found on seasonally wet sites below and on top of granite boulders in the Southwest Cape. 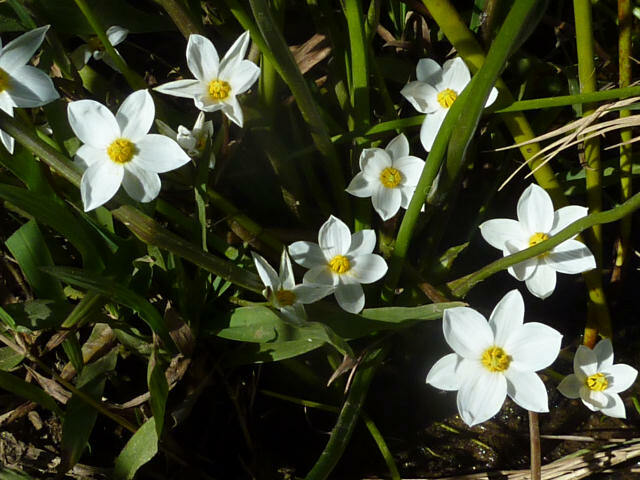 It has white funnel shaped flowers. Pauridia minuta (L.f.) T.Durand & Schinz grows on damp flats and lower slopes from the Southwest Cape to Southern Cape areas. 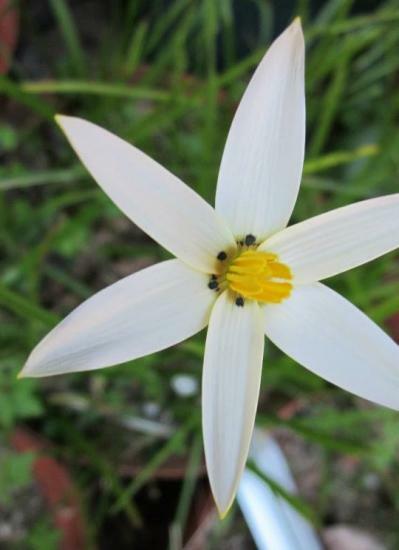 It has three to five leaves and white to pale pink bell shaped flowers. Photos by Cameron McMaster taken in the Overberg. 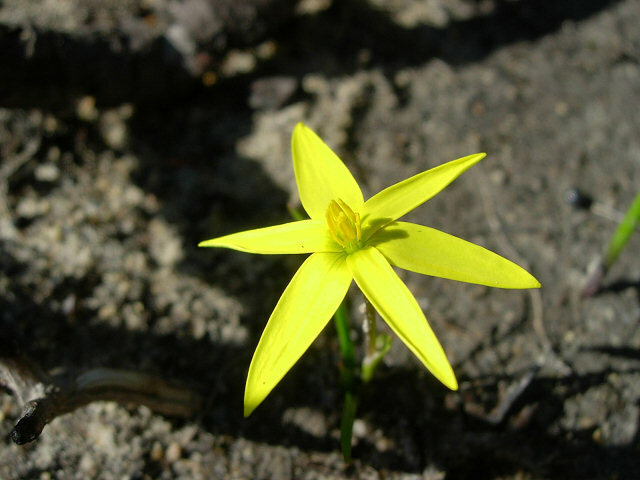 Pauridia monophylla (Schltr. ex Baker) Snijman & Kocyan, syn. Spiloxene monophylla (Schltr. 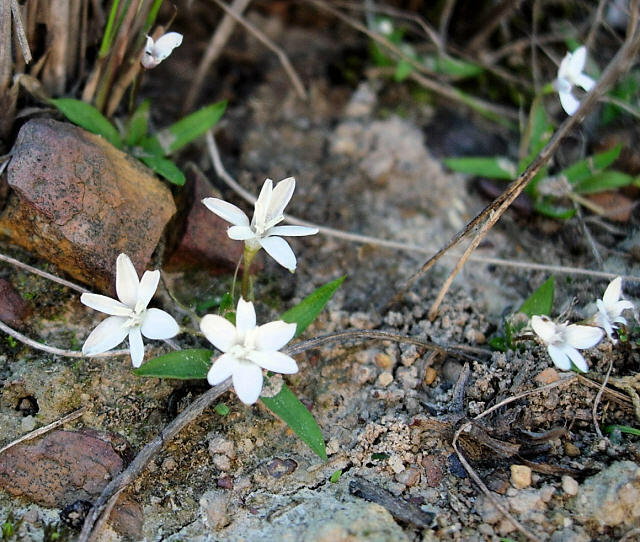 ex Baker) Garside, is found on sandstone slopes in the southwest Cape where it flowers December to April, especially after fire. 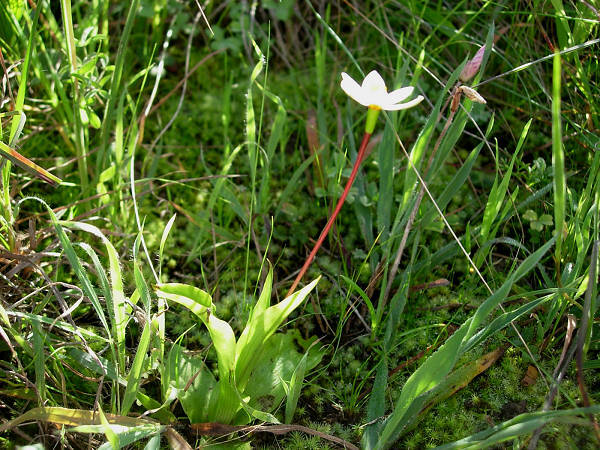 This is a very short plant, 2 to 10 cm high with the scape often subterranean. 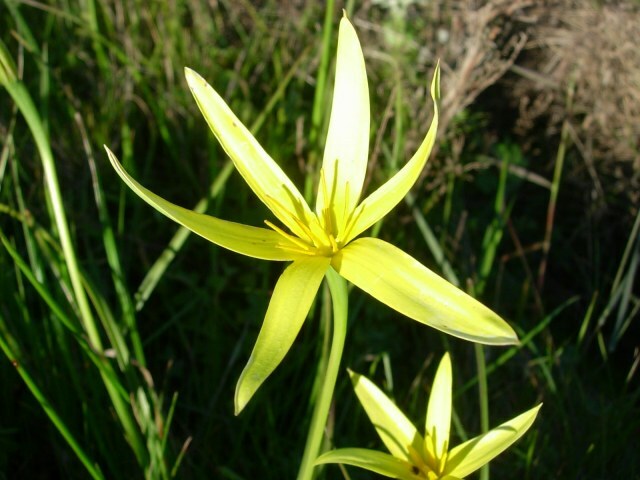 The flowers are yellow with a pale green reverse. Photos taken by Cameron McMaster in early February in Napier in the Overberg. 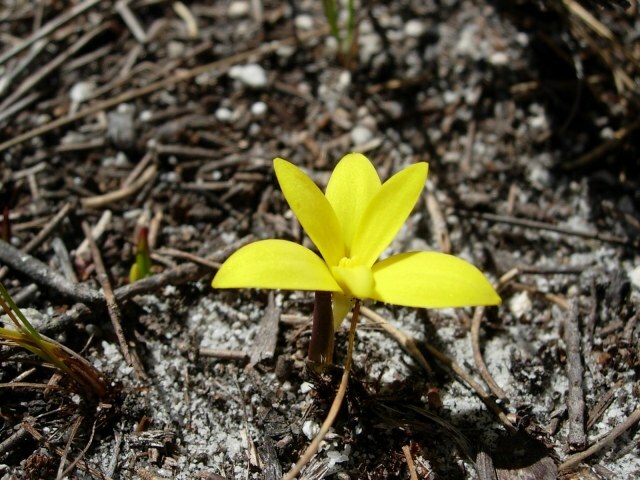 Pauridia occidentalis (Benth.) Snijman & Kocyan, syn. 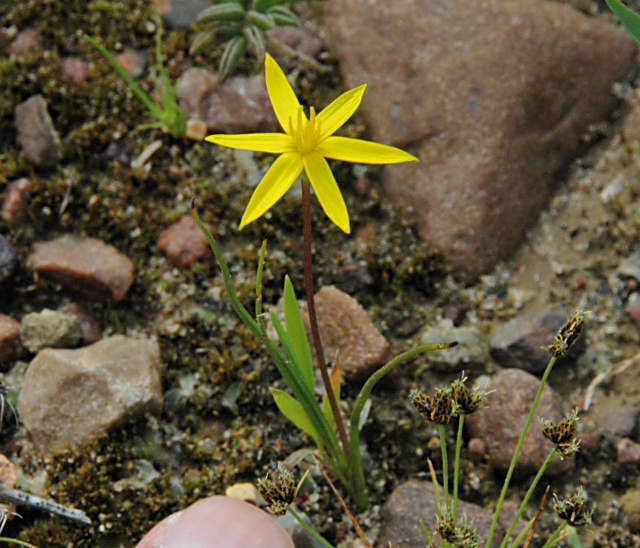 Hypoxis occidentalis Benth., grows from 5 to 20 cm high. 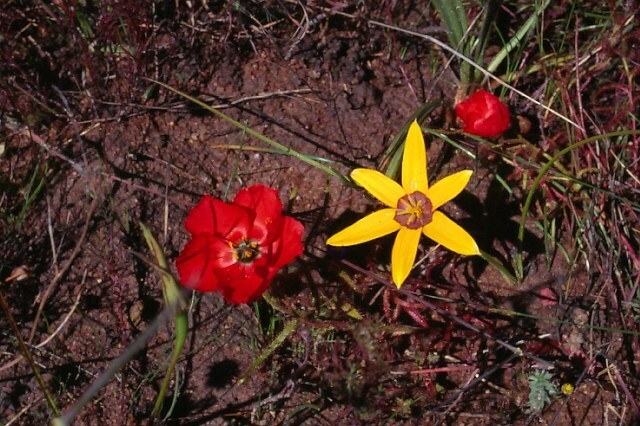 It is from southwestern Australia where it is found in winter wet areas, creek beds, granite outcrops and clay flats in sandy, clay, or laterite soils. 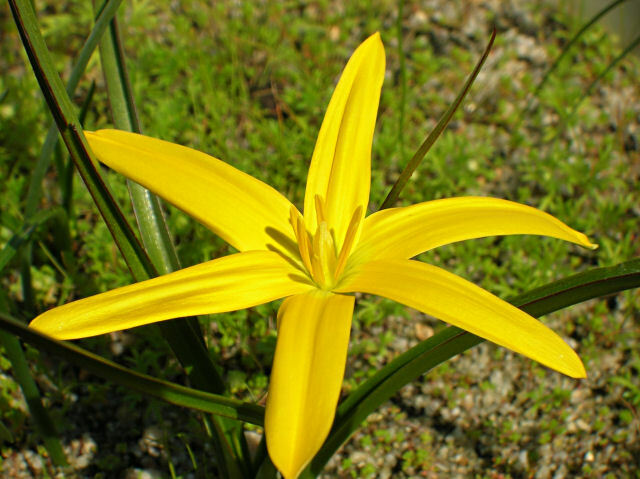 It blooms May to November and has dark linear, flat glabrous leaves and yellow flowers from ½-3.4 cm across. Pauridia occidentalis var. quadriloba (F.Muell.) Snijman & Kocyan, syn. 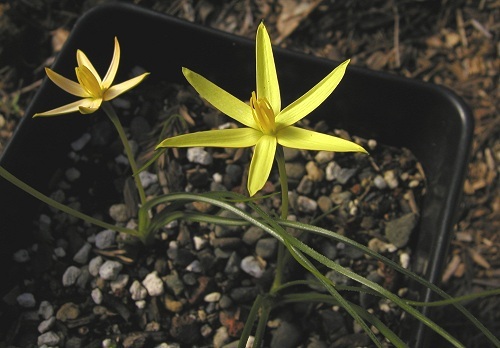 Hypoxis occidentalis var. quadriloba (F.Muell.) R.J.F.Hend., is distinctive in having 4 tepals and 4 stamens. Photos taken in William Bay National Park in Western Australia by Mary Sue Ittner. 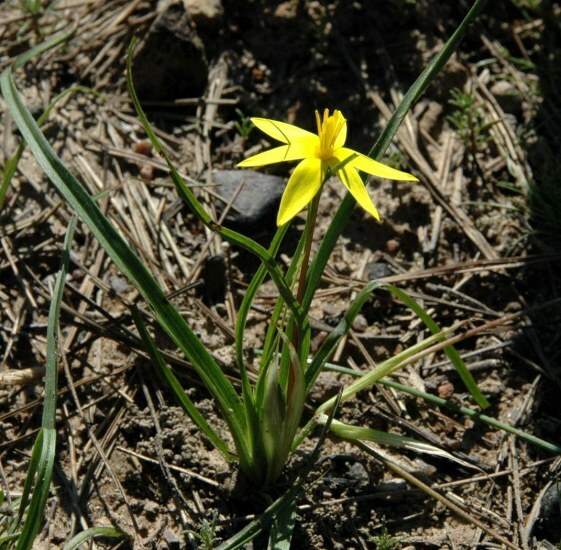 Pauridia ovata (L.f.) Snijman & Kocyan, syn. 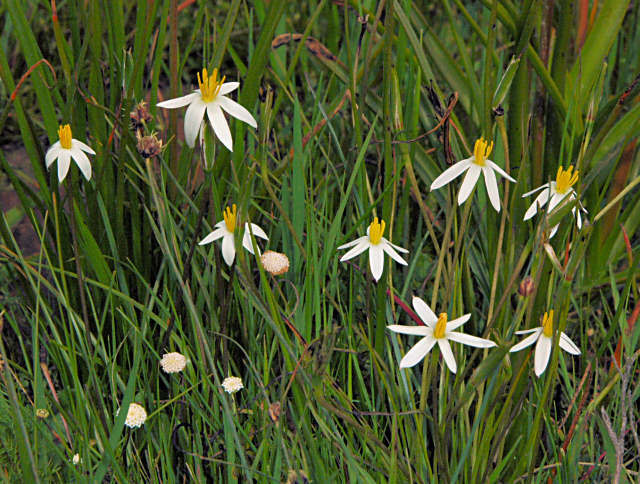 Spiloxene ovata (L.f.) Garside, now only includes the plants with white flowers and is restricted to the Overberg where it grows in heavily transformed and fragmented patches of renosterveld, most often on south to southeast facing hill slopes and embankments, in seasonally moist loam or clay-rich soils. In the paper referenced above a new genus, Pauridia gracilipes (Schltr.) Snijman & Kocyan, comb. 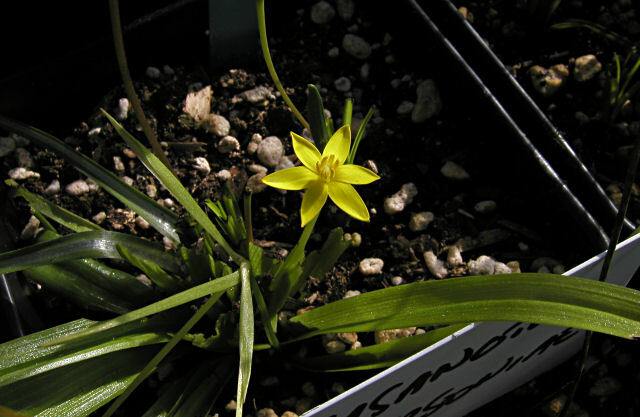 nov. was created for the yellow or orange flowered plants previously included in Spiloxene ovata. Pauridia ovata flowers July-September, often more visibly after fires. 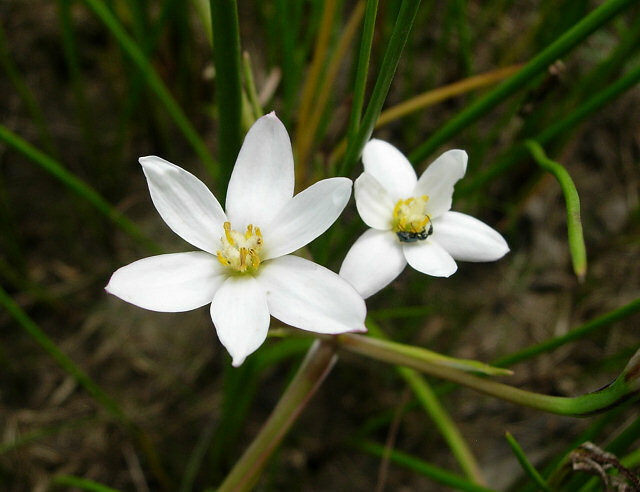 It has a globose corm, covered by tangled roots, a more or less erect, uppermost leaf that clasps the scape and pedicel, often for more than half its length, and a solitary flowered inflorescence with white flowers flushed with red wine on the outside of the tepals. Photos taken by Cameron McMaster at Napier in the Overberg. 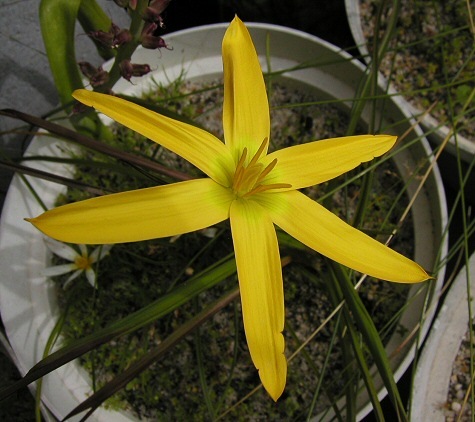 Pauridia scullyi (Baker) Snijman & Kocyan, syn. 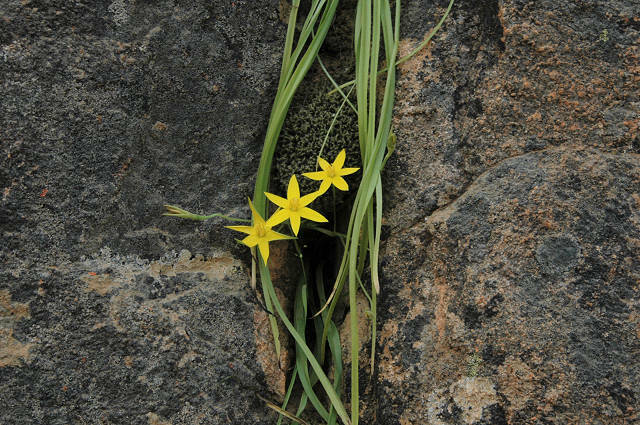 Spiloxene scullyi (Baker) Garside, is found on rocky hills in Namaqualand and in Namibia, usually on south-facing slopes in crevices or big rock faces. 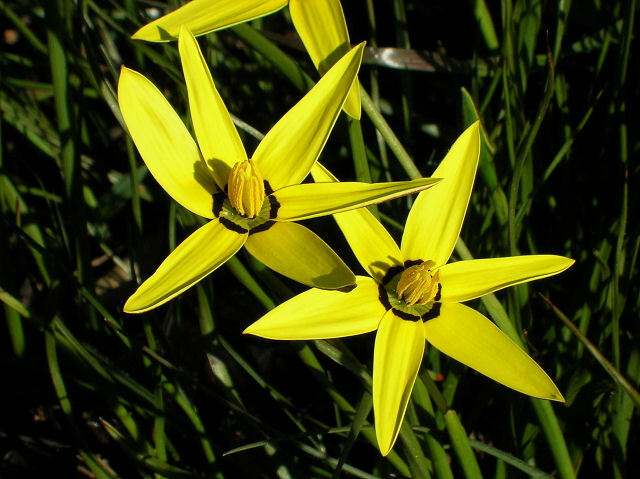 It has numerous narrow, linear leaves up to 15 cm long and 6 mm broad and yellow flowers. 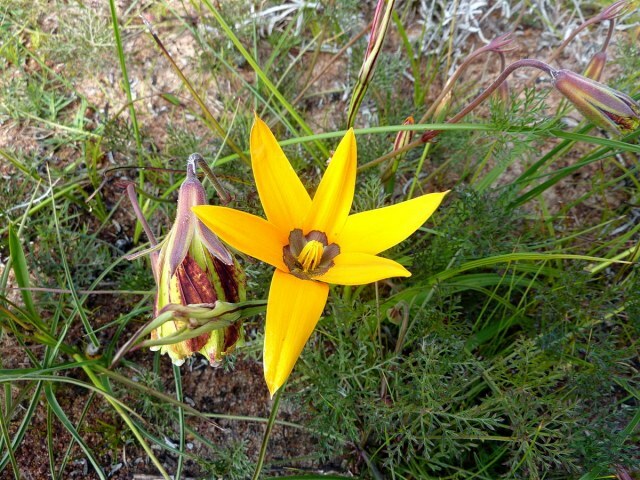 Photos taken in Namaqualand September 2006 by Bob Rutemoeller. 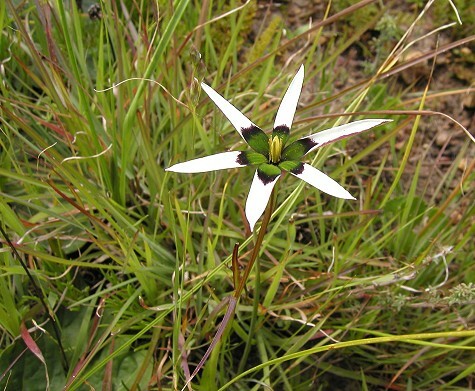 Pauridia serrata (Thunb.) Snijman & Kocyan, syn. Spiloxene serrata (Thunb.) 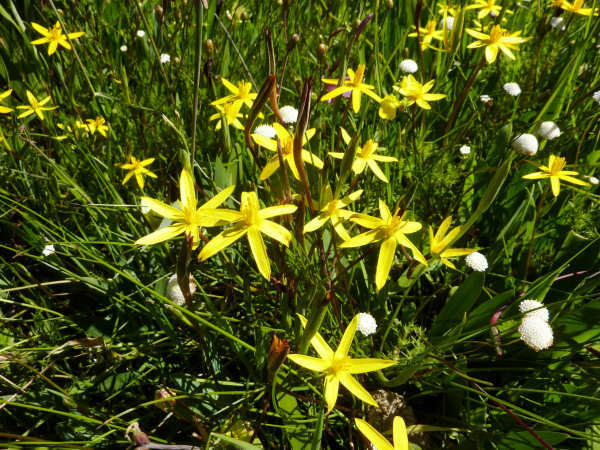 Garside, grows to 20 cm and is white or yellow with one, occasionally two, flowers per scape and a green reverse. Leaves are erect to recurved, channeled, usually with margins of minute recurved teeth. 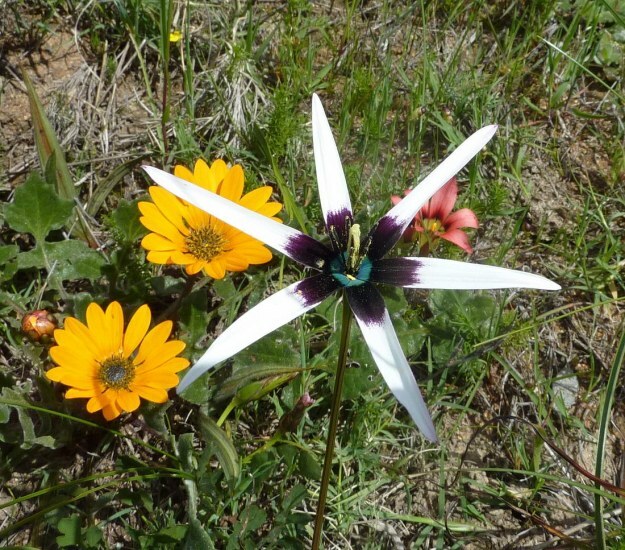 This species flowers winter into spring (May to October) and is found on inland or coastal flats in sand or clay, usually in seasonally damp sites from Namaqualand to the Roggeveld and the southwest Cape. Corms are finely fibrous, sometimes covered with twisted roots. 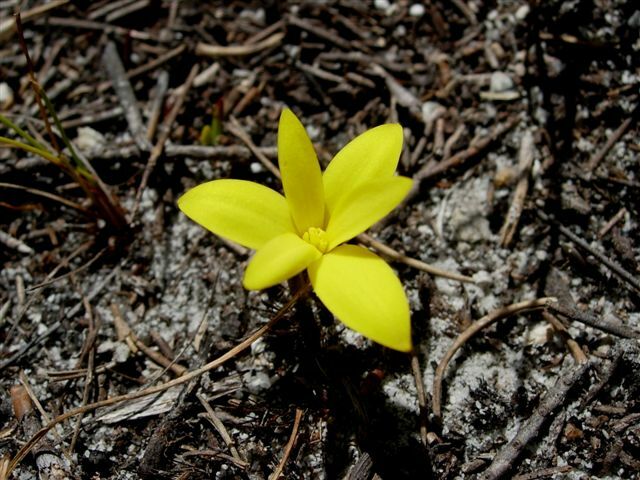 The yellow flowered plants are considered to be Pauridia serrata ssp. serrata. The first and second photos shows the plants and the third photo two corms on a grid of 1 cm squares. 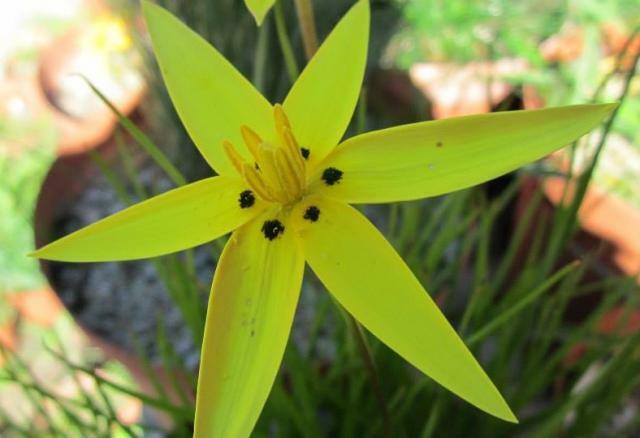 In cultivation in Northern California this is the first species to bloom, often blooming for many months in winter, especially on warm sunny days. Photos by Bob Rutemoeller and Mary Sue Ittner. The fourth photo is a closeup taken by Alan Horstmann. Photo 5 was taken by Cameron McMaster at the Biekoes Farm near Nieuwoudtville September 2011. 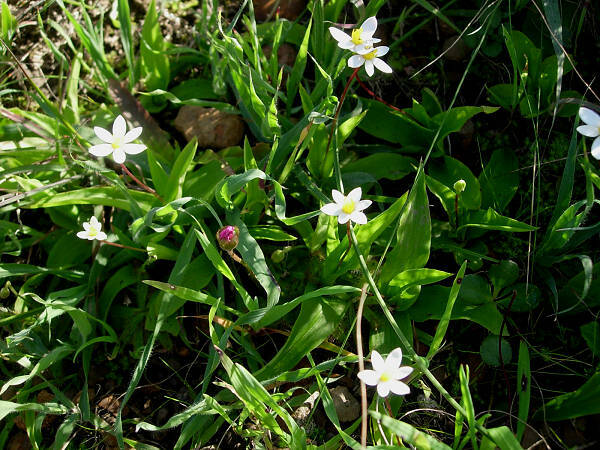 The white-flowered populations of Spiloxene serrata previously known as var. albiflora (Nel) Garside are now considered to be Pauridia serrata ssp. 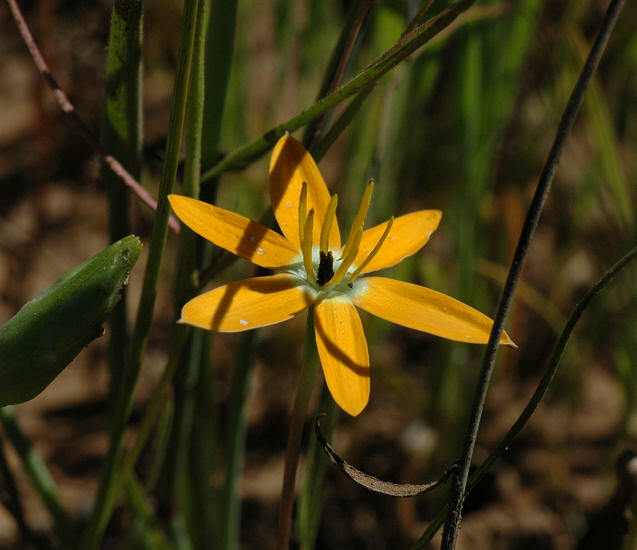 albiflora, being morphologically and ecologically distinct from the yellow-flowered and widespread populations constituting ssp. serrata. Photos 1-4 below from Bob Rutemoeller and Mary Sue Ittner were taken near Nieuwoudtville September 2006. The last photo from Cameron McMaster was taken in the same location. Pauridia trifurcillata (Nel) Snijman & Kocyan, syn. 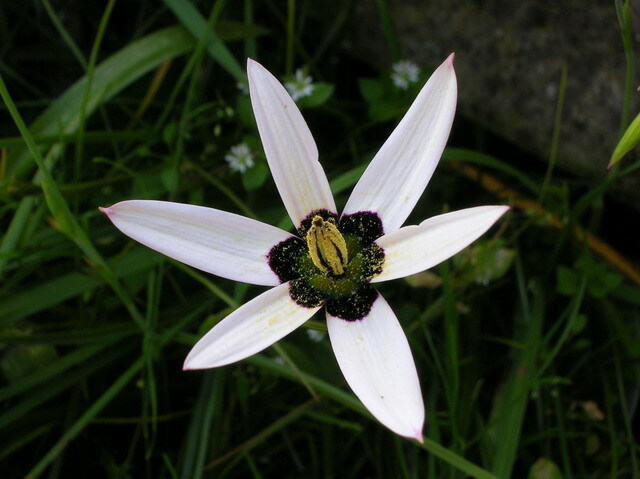 Spiloxene trifurcillata (Nel) Fourc., is an Eastern Cape species that grows from 8-15 cm at low elevations within grassland in habitats that includes moss-covered rocks on mountain slopes, shaded river banks, seasonally wet drainage lines, and the edges of vleis. 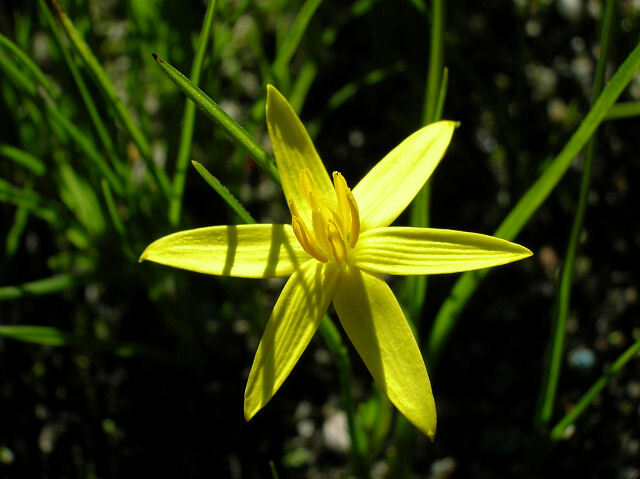 The unscented flowers are yellow, rarely white and backed with pale green and have unique stigma branches which are mostly erect, slender and closely cohering. Pauridia verna (Hilliard & B.L.Burtt) Snijman & Kocyan, syn. 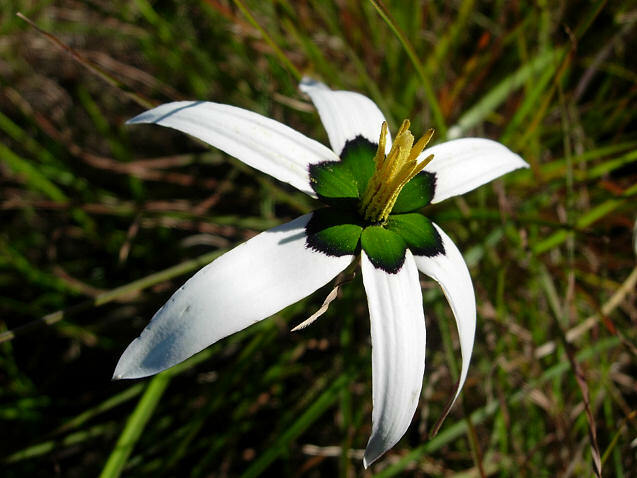 Saniella verna Hilliard & B.L.Burtt, is a dwarf species (up to 8 cm) often found in large colonies in short wet turf above 2700 m in the Drakensberg mountain areas of Lesotho and the Eastern Cape and KwaZulu-Natal, South Africa. 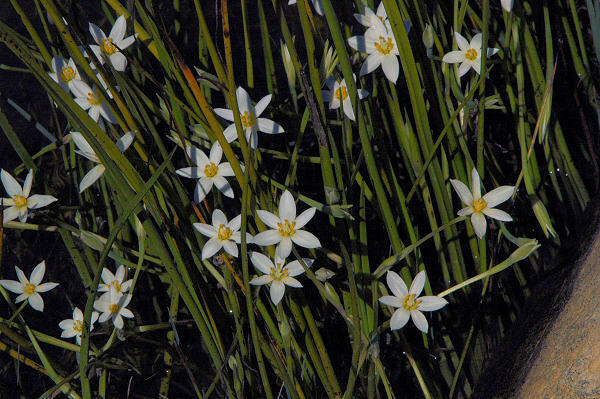 It has fleshy, deeply channelled leaves and solitary white flowers flushed yellow inside and flowers in November. It has an underground ovary. Photo courtesy of Robert Krejzl.